Over the last several decades there has been a transformation of the Samburu pastoral commons to new forms of land tenure and use. Government led land adjudication in the 1970s and 1980s established new forms of land ownership including group ranches and, in some places, complete privatization of land into individual parcels. An important question is what forms of land use and social relations emerge in the wake of land adjudication, and with what consequences? Can a “new commons” arise following transformation of the traditional commons? We address these questions by examining the aftermath of privatization in a Samburu community. Through ethnographic observations and interviews, we gain insight into peoples’ understanding of land use and current norms and practices and propose two diverse visions of the future – the “pastoralist imperative” of continued extensive livestock production and “future farmers” seeking a more settled, crop and wage labour-based livelihood. Using computer simulation models of the environment and households we conduct scenario analyses tracing the effects of land use practices and choices resulting from these different perspectives on variables such as livestock wealth, household income and food requirements, and ecological resources including grasses and shrubs. Our analysis suggests that privatization has yielded a “new commons” combining elements of individual ownership with shared management. These institutional innovations enable a continuation of extensive livestock production with new livelihood strategies that include a degree of land enclosure such as cultivation and land leasing. The analysis indicates that seemingly contradictory norms and practices can co-exist on the same land allowing considerable flexibility in production of livestock and crops. However, the models also demonstrate the limits that may be reached, particularly if common access is heavily curtailed. Pastoral livestock systems in Africa rely on access to large tracts of land enabling mobility in response to the semi-arid environment, spatial dispersion of rainfall and resultant pastures. Herders such as the Samburu of northern Kenya, discussed here, developed a specialized pastoral adaptation heavily reliant on livestock with minimal cultivation. Their survival in difficult environmental conditions may be attributed to successful joint management of extensive rangelands, social networks of reciprocity, and the tailoring of their production system to the environment (Dahl and Hjort 1976; Scoones 1994). Such systems have been characterized as positive examples of common pool resource management with communities following local norms regarding resource access and use (Ostrom 1990). Over the last several decades, however, there has been a transformation of the Samburu commons to new forms of land tenure and use. Government led land adjudication in the 1970s and 1980s established new forms of land ownership including group ranches (i.e. groups of households with joint title to a piece of land) and, in some places, complete privatization of land into individual parcels. Similar changes have occurred in other rangelands in Kenya (Mwangi 2007; Homewood et al. 2009), East and Southern Africa (McCabe et al. 2010; Bollig 2016) and in other pastoral systems, such as in Mongolia and China (Fernandez-Gimenez 2002; Williams 2002). An important question is whether the moves toward privatization effectively put an end to the commons, and thus to extensive pastoral livestock production, as many scholars of pastoralism would predict. If pastoralism continues, how does it continue? What forms of land use and social relations emerge in the wake of land adjudication, and with what consequences? Can a “new commons” arise following transformation of the traditional commons? We address these questions by examining the aftermath of privatization in a Samburu community, Siambu, located in southwestern Samburu County. Through ethnographic observations and interviews, we gain insight into peoples’ understanding of land use and current norms and practices. Using computer simulation models of the environment and households we conduct scenario analyses tracing the effects of particular land use practices and choices on variables such as livestock wealth, household income and food requirements, and ecological resources including grasses and shrubs. The models explore two aspects of land use that are highly relevant in areas where land is privatized: restricting grazing access (e.g. through fencing or prohibiting grazing) and increasing land area under commercial crop cultivation. Although privatization legally altered the Samburu system of communal land management, in this article we argue that, contrary to what economic theory predicts, most individual land owners continue to allow other herders to access their land. Thus, Siambu is in some sense a “privatized commons” where land is owned individually but also used communally. This is explained through the operation of new local rules of land use that support continued collective access to land as well as moral pressure to continue granting access on private land. In this way, privatization has yielded a “new commons” combining elements of individual ownership with shared management. What is new here are the ways that local actors respond to de jure changes in land tenure with their own informal rules and norms. These institutional innovations enable a continuation of extensive livestock production alongside new livelihood strategies that include some land enclosure. There has been a trend toward privatization of pastoral commons in several countries since the 1980s (Reid et al. 2014). In Kenya, this was a result of land adjudication policies influenced by ideas of the “tragedy of the commons” (Hardin 1968) and economic theories that predicted that privatization would increase investment and productivity (Demsetz 1967). In other cases, such as Mongolia and China, the shift away from collectivization and rise of market-led policies resulted in moves toward privatization of livestock and, to some extent, land (Fernandez-Gimenez 2006). Scholars have pointed out the risks associated with privatizing the commons, particularly how fragmentation of landscapes can threaten extensive livestock production (Galvin et al. 2008). Several studies have pointed out ways in which pastoralists, through various forms of social relations, have continued to use privatized land in common (BurnSilver and Mwangi 2006; Galvin et al. 2008; Lesorogol 2010, 2014; Coleman and Mwangi 2015). In some cases, this continuation appears to represent successful collective action to re-assert common pool resource management, or at least continued access to pasture on others’ land (e.g. Archambault 2016). Coleman and Mwangi (2015) argue, however, that re-aggregation of pasture following privatization among Maasai in southern Kenya reflects the dominance of wealthier landowners who push for re-combination of pasture for their own benefit. As we discuss below, differences in livestock wealth also influence positions held by community members in Siambu regarding land use. This research demonstrates that land privatization in pastoral regions is not the end of the story of land use change, but rather one stage in ongoing transformations, including emergence of “new commons”. Another phenomenon accompanying privatization of pastoral land is livelihood diversification. There is strong evidence that pastoralists are diversifying into livestock trade, wage labour, crop cultivation, conservation/tourism and commodity trade (Little et al. 2001; Lesorogol 2008a; Homewood et al. 2009; McCabe et al. 2014). Diversification may be a risk coping strategy as households and individuals seek alternative ways to make a living in an increasingly challenging environment for pastoralism, including loss of land from privatization. A recent study suggests that diversification away from reliance on livestock may negatively impact social networks for exchange, with potentially negative welfare effects (Baird and Gray 2014). On the other hand, diversification may also enable greater investment in the pastoral livestock sector as income from other sources is re-invested there. This pattern is noted by McCabe et al. (2014) and we have observed this for decades among Samburu men who engage in wage labour in order to build their herds. It is less clear how diversification affects attitudes toward pastoral livestock production and the commons themselves, something that we discuss below. What visions of the future of pastoralism are prevalent among community members living on privatized common land? What land use choices result from different visions of future livelihoods? What are the likely impacts of these land use choices for people and the environment? We focus here on our research in Siambu, a community located in the southwestern part of Samburu County on the Lorroki plateau (Figure 1). Siambu occupies the highest elevation region of the county, about 2500 m above sea level. It has relatively cooler temperatures, higher rainfall, and greater potential for crop production than the lower elevation regions that make up most of the 20,000 sq.km of the county. Since the late 1980s Siambu (2000 ha) has been composed of private land parcels of roughly equal size (9.3 ha each). Male residents of Siambu are also registered members of a group ranch that extends north from the privatized area on much less desirable land. Virtually all members of the community are ethnic Samburu and prior to privatization practiced semi-nomadic pastoralism grazing herds of cattle, sheep, and goats on local pastures during wet seasons and during dry seasons and droughts migrating to better pastures when necessary. Currently, most households in Siambu retain a permanent household on their private land while herders migrate with livestock seasonally. Livestock are kept mostly for milk production but are sold to meet cash needs for food, clothing, medicine, school fees, and other needs. Sheep and goats represent more liquid assets than cattle and are sold more frequently and occasionally slaughtered for meat during rituals or times of stress. Since privatization, many Siambu residents have begun cultivating maize, beans, and vegetables for household consumption though some households sell surplus crops. About two-thirds of households engage in cultivation on fields averaging 0.4 hectare with the largest farm being 3.2 hectares. Approximately one third of households lease out part of their parcel to commercial farmers who plant wheat, barley or maize (Lesorogol 2010; Grimm and Lesorogol 2012). Map of Siambu in Samburu County, Kenya with individual parcels marked. The group ranch extends north and west of the private parcels. Land to the east includes a government forest and other group ranches. Land privatization in Siambu was complex and took place over much of the decade of the 1980s (see Lesorogol 2008b for a complete account). Many areas of Samburu County were adjudicated into group ranches, but there was a provision enabling individuals to make land claims. In Siambu, 37 individuals did so and were initially granted individual parcels. Other members of the community discovered what had happened and many were opposed. A conflict ensued between those favouring collective ownership and those supporting privatization. Eventually, a compromise was brokered in which each registered household received a 9.3 hectares parcel while an additional portion of land was designated a group ranch for all registered households (See Figure 1). By the early 1990s, title deeds were issued for 240 individual parcels enabling owners to buy, sell, or lease out their land. Lesorogol has conducted field work in Siambu since 2000 with annual visits and extended stays during 2000–2001 (18 months) and 2005 (6 months). Prolonged engagement with the community enables observation of changes in land use, community wellbeing, and attitudes. A random sample survey of 100 households covering a range of topics including demographics, economic activities and income (employment, trade, cultivation, livestock sales, etc. ), livestock wealth/holdings, expenditures, and food intakes was conducted in 2000, 2005, and 2010. The 2010 data were used to construct the computer simulation models used in this study. A sub-sample of thirty households stratified by age of household head, income, and wealth participated in four rounds of surveys between 2009 and 2011 focused on current land use practices and perceptions of emergent land use rules. Further information regarding the views of a range of Siambu residents about current land use practices, norms and rules of land use, and preferences for the future are drawn from a set of twelve in-depth interviews conducted during 2008 and 2010. All interviews were conducted by Lesorogol, audio recorded, transcribed, and translated into English for analysis, and stored and coded using Nvivo 8 software. The goal of our integrated ecological and household computer models is to have the services ecosystems provide influence the behaviour and conditions of people and communities, and to have human behaviours influence ecosystem services. In the Siambu system, we used two linked tools, the SAVANNA modeling system representing the ecosystem and DECUMA, an agent-based model representing households. We used the process-based, spatially explicit ecosystem model SAVANNA (ver 4L), originally developed more than 25 years ago by Coughenour for the Turkana District of Kenya (Coughenour 1985), and updated and used widely since (e.g. Coughenour 1992; Eastman et al. 2001; Boone et al. 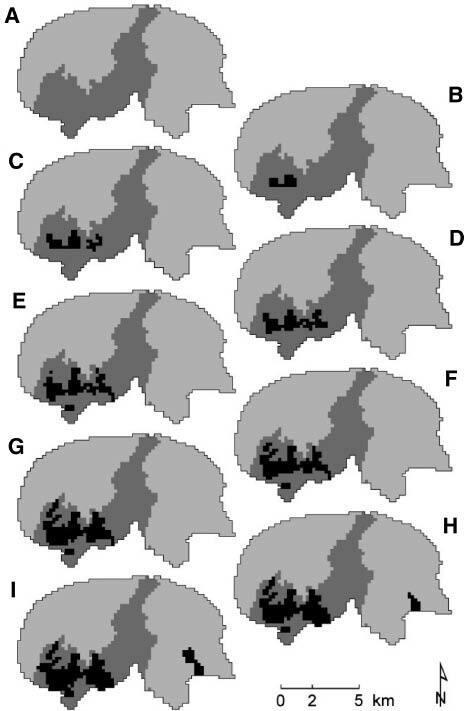 2002, 2005, 2011; Thornton et al. 2004). The model is a series of interconnected FORTRAN computer programs that simulate primary ecosystem interactions in arid and semi-arid landscapes. SAVANNA divides landscapes into a grid of square cells, and for each cell, ecological processes are modeled. SAVANNA reads spatial data that characterizes the cells to elevation, slope, aspect, soils, and vegetation type. Precipitation and minimum and maximum temperatures from a series of weather stations or other weather data are read by the program. Plants are represented as functional groups, such as palatable grasses, palatable forbs, unpalatable herbaceous plants, medicinal shrubs, or acacia woodlands. Wildlife and livestock may be presented in SAVANNA as functional groups as well (e.g. antelopes), but these are usually individual species (i.e. zebras, cattle, goats). When joined with DECUMA, however, livestock dynamics are represented in that agent-based model. Results are summarized each month, with spatial and temporal data produced. See Ellis and Coughenour (1998), Boone (2000), and http://www.nrel.colostate.edu/projects/savanna/ for more detail about SAVANNA including information on more recent versions of the model. Our DECUMA (DECision-making Under Conditions of Uncertainty for Modeled Agents) model represents individual households occurring at specific locations on earth, with households owning specific livestock herds. DECUMA simulates in a relatively complete way individual households, adjusting livestock distributions on a weekly basis, and making other household decisions on a monthly basis. Each household is assigned a location and initialized using observed survey data that include numbers and sexes of household members, the species, numbers, and sexes of livestock owned by the household, area in cultivation, and incomes and expenses. For houses where surveys are conducted, we use the data directly to initialize conditions. For other households, we used the closest household for which a survey was available to initialize conditions. Households then differentiate during simulations as they make unique decisions responding to their local environments. 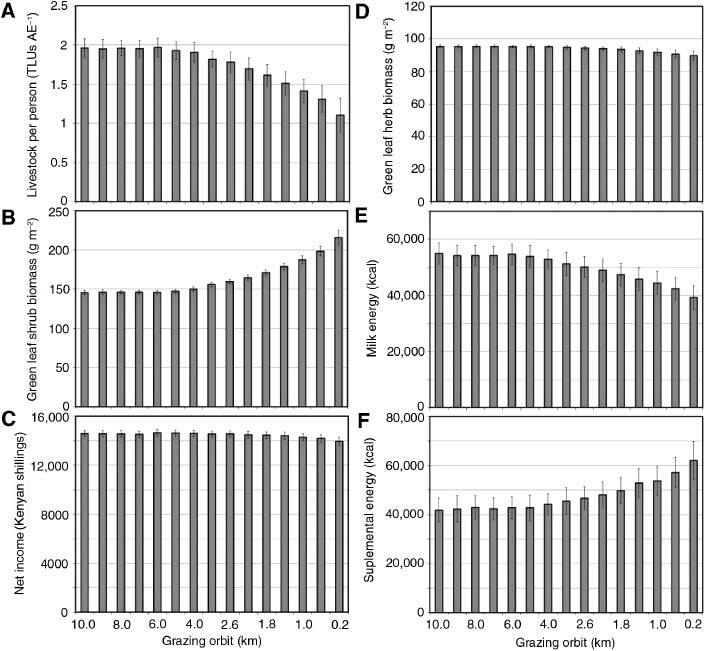 In simulations, livestock herds are represented by age-structured Leslie matrices, with reproduction and mortality tied to ecosystem function. Households harvest crops at appropriate months, with yield based in part on precipitation in months prior to harvest. Households then calculate their cash flows, tallying money gained from the sale of products such as milk, crops, and livestock trading, and money spent on livestock husbandry, cultivation, household needs, and school fees. The food energy needs of household members are then met. DECUMA is described in detail in Boone et al. (2011), with supplemental materials to that product providing a description of the model (Grimm et al. 2010). SAVANNA and DECUMA are closely linked, meaning that they pass information back-and-forth each time-step of a simulation. DECUMA receives from SAVANNA habitat suitability indices that are used by herders when deciding where to graze animals. SAVANNA accepts from DECUMA the distribution of animals each week, and reports back the energy those animals acquire while feeding. If too many animals are present, for instance, the plants represented in SAVANNA are overgrazed and less productive, causing a decline in the number of livestock. The models are linked in a few other ways as well. For example, SAVANNA provides to DECUMA the precipitation it interpolates for landscape cells each month so that the yield from crops may be estimated in a way that is sensitive to rainfall. The SAVANNA-DECUMA model was adapted to conditions in Samburu County. This analysis focuses on the Siambu site which includes the area comprised of 240 small parcels plus surrounding forests to the east, north, and off the escarpment to the west. The total area simulated was 84.5 km2. Given the small area, our final 20-year simulations were at high resolution, with landscape cells 200 m by 200 m represented. Long term research at the sites provided us a wealth of household data; almost a third of the households modeled had supporting survey data. To represent weather, we used the data compiled by the Climatic Research Unit (CRU), University of East Anglia, Version TS 3. Siambu receives about 850 mm annual precipitation in a bimodal pattern of annual rainfall. We used Normalized Difference Vegetation Indices (NDVI) collected at 250 m resolution and distributed by the MODIS program (product MOD13Q1; ORNL DAAC 2011). Monthly long-term NDVI values for landscape cells (i.e. 12 surfaces total, one per month) were used to indicate which cells were relatively green and which were relatively brown in the regression relationships used to interpolate weather data. For a digital elevation model (e.g. elevation, slope, and aspect used by SAVANNA) we used the Shuttle Radar Topography Mission product (USGS 2004>). The Kenyan SOTER soils database was used to represent soils (Kenya Soil Survey 1995). Land cover was taken from the Kenyan AfriCover product, which is derived based on on-screen digitizing of Landsat satellite data (FAO 2001). Distance-to-water maps were calculated based on water sources recorded on 1:50,000 scale topographic maps and augmented by GPS coordinates of water points collected by the research team. Initial herbaceous, shrub, and tree cover were estimated from the MODIS vegetation continuous field product (MOD44B). Lastly, we created spatial surfaces that contained values between 0 and 100 for areas inside the parcels owned by individuals in Siambu and other areas, to control when people grazed on their parcels or the surrounding forest. Detailed household data were available for 74 homes in Siambu (31% of 240). Given the ambiguity in the locations of most of these households, we created 10 instances of households for each study area, each a different distribution of households for those with unknown coordinates. Households with known GPS locations were placed as surveyed. Other households were randomly assigned to one of the mapped points. To fill-in the remaining households, household points were selected and the information from the nearest home with survey data was used to initialize that household. Because of this uncertainty, we created 10 instances of household assignments to the spatial locations, with randomly selected survey entries used to initialize households in question. We wished to know the variation in responses from simulations due to the specific changes we make to support scenarios, not due to the timing of droughts or other climate events. To account for this variability, observed weather data were not used in modeling. Instead, weather data were randomized by year to create new instances of climate records. In modeling, we used five of these randomized weather patterns. In summary, in each study area, each scenario value of interest (e.g. a given level of mobility) was simulated 50 times, once for each of 10 household randomizations in combination with each climate randomization. These simulations allowed us to calculate both means and deviations in results, allowing us to move beyond the uncertainties in household distributions and the single instance of observed weather available. In each of the scenarios, note that deviations in results were always compared to the appropriate baseline simulation. For example, assume a scenario value of interest (e.g. 5 km grazing orbit) used household distribution #6 and weather randomization #3. We stored corresponding baseline simulation results created using household distribution #6 and weather randomization #3. In analyses the results of the baseline simulation were subtracted from the scenario results to yield differences in responses. This ensured that we were making fair comparisons across simulations (e.g. a simulation with a drought in year 14 is compared to a baseline with a drought in year 14). We then calculated the means and standard deviations of the responses to yield summary results. Two diverging patterns of land use practices and views about future livelihoods emerge from interviews and observations in Siambu. For analytical purposes, we call these views “the pastoralist imperative” and “future farmers”. These labels are in some sense “ideal types” that synthesize information from interviews and quantitative data from surveys. They are not meant as a statistical description of the Siambu population nor do people necessarily consciously “belong” to either group, and they may represent more extreme ends of a spectrum of perspectives. We believe they are useful, however, for understanding how differences in livestock wealth, diversification of livelihoods, land use practices and changing values and attitudes are coalescing in fairly consistent ways. The two patterns have important implications for the future of land use including how shared management of the “new commons” in Siambu proceeds. Some Siambu residents continue to keep relatively large numbers of livestock relying on them for food and income. This group ranks in the top two quintiles in terms of livestock wealth, but may not have high income from sources other than livestock. Table 1 shows the distribution of livestock holdings by wealth quintile in 2010 (measured in livestock). The top two quintiles own 75% of the livestock in Siambu and average about 3.6 TLU per person. This is not necessarily sufficient for complete reliance on livestock (though the wealthiest families own almost 10 TLU per person). Figure 2 shows that livestock and wage labour are the most important contributors to household income in these quintiles. Livestock are even more significant when the contributions to home consumption from milk and meat are included in this calculation (Lesorogol 2008b). Most of these households also engage in cultivation, but farm sizes are modest, averaging about 0.4 hectare, which is similar across all quintiles (Figure 2). These households generally favour retaining access to pasture on privately owned parcels since their livestock cannot survive only on their individual parcel. They prefer to continue pastoralism as their primary livelihood strategy, and express concerns about restricted access to grazing. Siambu livestock holdings by wealth quintile, 2010 (n=64). Notes: Wealth quintiles calculated by ranking all households by household TLU with cutpoints at 20% intervals. TLU is tropical livestock units; 1 cow=1 TLU; 1 sheep=0.12 TLU; 1 goat=0.13 TLU. Per adult equivalent converts as follows: adult male=1; adult female=0.86; children 11–17=0.96; 6–10=0.85; 0–5=0.52. Income shares and crop acreage by wealth quintile (Siambu, 2010, n=60). In contrast are those households that own few livestock, which they tend to graze within their private parcel. These are households in the poorer three quintiles for wealth (Q3, 4, and 5 in Table 1 and Figure 2). From Table 1 we see that these households own relatively few livestock, averaging less than 1 TLU per person across the three quintiles. 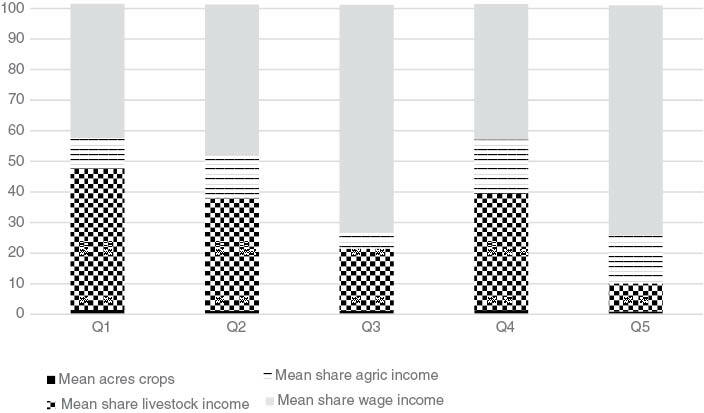 Figure 2 reveals that wage labour and agriculture are more important sources of income, although livestock is still contributing to income, particularly for Q4. These households devote more effort to cultivation and often have off-farm income. They are in the lower quintiles of livestock wealth, but may be in the higher quintiles for income. For example, almost 50% of households in Q3 for livestock wealth are in the top two quintiles for income, and about 40% in Q4 for wealth are in the top two income quintiles. They may have higher education levels than households with more livestock, partly because they do not require as much herding labour and can send more children to school. Some educated individuals prefer a lifestyle different from traditional pastoralism and want to change livestock production methods in ways they perceive as “modern”. Many see a future with fewer livestock and more cultivation and employment. Some of these households restrict access to grazing on their parcels or charge others to graze on their land. The following case studies illustrate these two types of households, revealing the strategies of current land use and the preferences expressed by each. … [it’s] very hard. Because when we wanted to go to [the escarpment at the edge of] Siambu, I went with Nolduka and my son’s wife – we all went to take these few animals, because cows are only four [the other cows were away at a cattle camp at this time] and fifty sheep and goats, so all of us took them because they would run into the wheat farms. They described having to weave between the planted fields to access grazing either on peoples’ private parcels or beyond that on the group ranch land. Finding enough grazing for their livestock was a continuous challenge that included carefully monitoring the livestock so they do not eat crops, for which they would be fined. For example, on a recent visit Longishu was upset with his granddaughter who had been herding the sheep during the day and allowed them to wander onto the neighbour’s maize field. He worried that the neighbour was going to fine him for the crop damage. He also told us of a recent conflict with another neighbour. One of Longishu’s sheep had gone into that neighbour’s farm and the neighbour had caught the sheep. Instead of holding the sheep and telling him to pay a fine, the neighbour slaughtered the sheep. Longishu considered this theft, but the neighbour still wanted to fine him for the crop damage. He refused to pay the fine saying that if the neighbour persisted in trying to fine him, he would also fine the neighbour for stealing his sheep. Nolduka related how the search for pasture involved negotiation with neighbours over access to grazing areas, but also a certain amount of sneaking. She claimed that people often did not request access to grazing on others’ land but rather took their livestock through the land hoping that the owner would not notice, or would allow them to pass through as long as they did not stop to graze. Clever herders, however, would take their time “passing through” so that the livestock could graze as they slowly moved through the parcel. She commented that her family also did not allow people to graze for extended periods on their land, though they could pass through. It is clear, however, that without constant vigilance from land owners, passing through can easily turn into grazing. Longishu and Nolduka sometimes move their livestock beyond Siambu to find grazing. This was the case during the drought of 2008–2009. The drought was less severe in Siambu than in many other parts of the district, but finding enough grazing was still a challenge. At that time, Longishu moved his animals about 40 km away to graze in a group ranch with relatives. Such a migration is quite common among Samburu pastoralists but requires having social networks in areas that have grazing in order to gain access. Despite the challenges of finding adequate grazing for their livestock, this family is committed to maintaining their relatively large herd. While cultivation is an important activity for them, livestock remain the mainstay of their livelihood, contributing 87% of household income compared to 8% for agriculture. Although they recognize that if more and more people in Siambu restrict access to grazing, it will be increasingly difficult to find enough pasture, there are no signs that they are prepared to transition out of a primarily pastoralist orientation. you must restrict your animals because you can’t move to Loiwoiting, Sawan, go to Maralal, Baragoi, when you have a farm here. You must fence your farm so that you have grass to feed your livestock, because when you take them down there [over the escarpment, into the group ranch land], the enemies will take them, so you will keep them here and they eat their grass. This quote illustrates one reason for not migrating, the insecurity and risk of livestock theft. For Nashampai, finding herding labour is a challenge, since all of her children are in school and she is a widow, she would have to hire a herder or combine her livestock with another family in order to migrate. Nashampai: Yes, it’s bad [to refuse livestock grazing] – they said that before…. Nashampai: It’s different. Because the government has changed everything. Now, everyone has changed their mind [heart]. You close yours [parcel]. CL: And that’s okay here. Nashampai: It’s okay. Now, everything is a fence. This exchange illustrates the shifting norms around grazing access. When she says ‘the government has changed everything’ she refers to land privatization and how people have come to see land as a private possession that the owner controls. If he wants to deny others grazing, he has the right to do so. At the same time, the moral pressure to allow grazing is not entirely absent. During the drought of 2008–2009 many land owners in Siambu, even those who claimed they did not allow grazing on their land, did relent and allow livestock to graze. Drought brought to the fore the continued need for reciprocal grazing access and even Siambu residents understood this need, since many of them had to move their own livestock and negotiate access to grazing elsewhere. When the rains returned, access became more restricted once again. In the future envisioned by Nashampai, reciprocity will be less needed since people will have fewer livestock (perhaps more productive ones, such as the exotic dairy cow she hopes to purchase) that can be supported on their individual parcels. They will also invest more in cultivation and produce more food from that source, lessening their reliance on livestock. Finally, having educated their children, they hope that they will be able to obtain jobs that will bring in more income and many of that generation may exit the pastoral economy entirely. In 2010, Nashampai’s household PAE income (Quintile 1; 96% of household income) exceeded that of Longishu (Quintile 3). This divergence of views of the future may explain why incipient rules of land use are still quite contested in Siambu. For example, there is an evolving rule that stipulates that anyone who refuses access for grazing on his parcel cannot graze on others’ parcels. Our surveys show a high level of awareness of this rule, but disagreement regarding whether the rule has actually been formally agreed upon and if and how it is enforced. This rule encourages reciprocal grazing access and favours people with more livestock by ensuring that those who restrict access will also lose access to others’ land. Those who want to enclose their land may view the rule as punitive, since it eliminates their ability to access grazing outside their parcel, which they may need to do in a drought situation. Furthermore, the rule is opposed by some people who argue that individuals have the authority to decide how to use their land and the community cannot restrict it. As a practical matter, it requires considerable coordination among land owners to enforce such a rule since everyone would need to agree to prohibit the offending party from accessing their private parcels for the rule to have the intended effect. Even though there is not a consensus about this rule, there are some individuals who have been prohibited from grazing on others’ land because they refused access to their own (Lesorogol 2014). Another rule stipulates that livestock owners will be fined if their animals eat or damage crops. This rule, which favours cultivation, is unanimously recognized by informants as being in effect, perhaps because the majority of people in Siambu do some cultivation and therefore stand to benefit from the rule. However, this rule represents a complete about-face from earlier norms that discouraged cultivation, then viewed as a threat to livestock’s access to pasture. Finally, there is the Samburu norm that livestock should not be denied access to grazing, particularly during times of stress such as dry season or drought. All informants agreed that this was a norm among Samburu people, and, as noted, during the latest drought of 2008–2009 many people were subjected to the pressure of herders wanting access to their private parcels for grazing. People with more livestock tend to cite this norm as justification for retaining more access to grazing in the privatized land in Siambu and they view the unwillingness of people to comply with the norm as a harbinger of difficult times for livestock herders in the future. Contested rules and norms such as these reflect the shifting social relations that are occurring in Siambu related to future livelihoods. While we have contrasted the divergence of views between people like Longishu and Nashampai, the reality is grayer. Even people who are very committed to more cultivation, more education, more employment, and fewer livestock still feel the collective pressure to grant access to grass to starving livestock. And even those who pursue a pastoralist lifestyle simultaneously defend their rights as land owners and value their autonomy over land use on their property. They are also sending more of their children to school and hoping that this investment will lead to more sources of income outside the pastoral sector (Lesorogol et al. 2011). These materials show us that there are diverse livelihood strategies co-existing in Siambu and private and common rights co-exist on the same land. The next step in our analysis uses the computer simulation models to suggest how these strategies could play out in the future. The views of Longishu and Nashampai provide two useful points on a continuum of livestock mobility, with Longishu challenged in practicing mobile herding, and Nashampai content to graze her few animals on her own parcel. We used our coupled models to address a scenario that described effects of reduced mobility by livestock. Reduced mobility was represented by changing the distance herders were able to move their animals from their home location, termed their grazing orbit. The low end of mobility was set considering the 9 hectare parcels (Figure 1) available to those who would fence their parcel. A stylized representation of such a parcel would be a circle 172 m in radius. 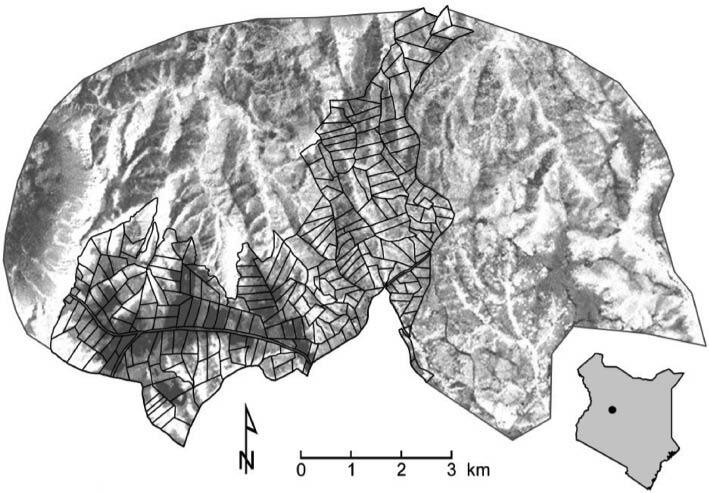 Our modeling resolution is 200 m cells, so we represented changes in mobility by modifying grazing orbits to be from 200 m to 10,000 m. The Siambu area simulated was 14 km in its longest dimension, so a grazing orbit of 10 km meant that herders could select from anywhere in the area. The number of TLUs per AE declined dramatically with reduced herd mobility. Figure 3 compares two scenarios, the control simulation where grazing orbits were 10 km, and the case where grazing orbits were 0.2 km. During the 20 year simulation, livestock numbers decreased by almost half, a profound potential loss for people as food insecure as the Samburu (Iannotti and Lesorogol 2014). Livestock numbers were relatively stable with grazing orbits 4 km or above, then declined rapidly (Figure 4A). TLU per AE comparing grazing orbit of 10 km (control) and 0.2 km (representing fully fenced individual parcels). Changes in selected variables by length of grazing orbit. Declining livestock numbers have implications for numerous ecological and social simulation results. 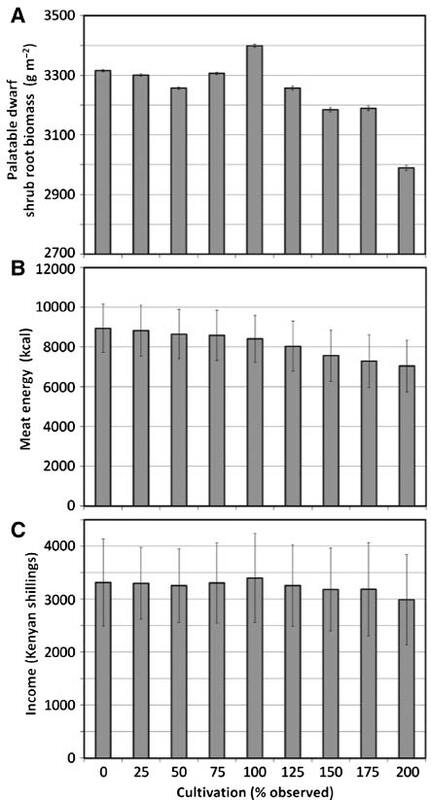 For example, shrubs in ungrazed parts of the landscape were able to expand (Figure 4B), and green leaf herbaceous biomass decreased slightly (Figure 4D). 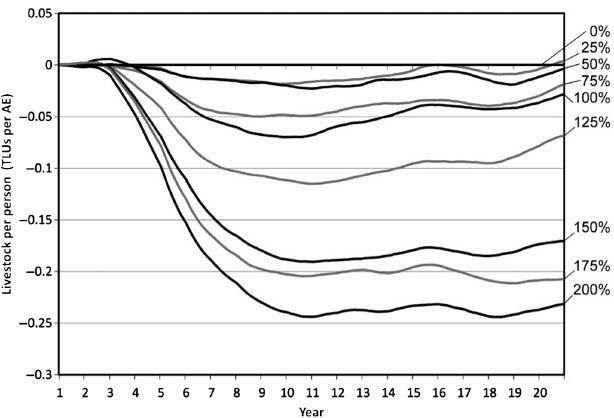 As cattle numbers declined, the energy families acquired from milk declined (Figure 4E). Net income for families decreased a small amount (Figure 4C), but that response was mostly buffered by families selling livestock to purchase maize. Those sales in a given year mean less milk available in succeeding years, evidence of a spiral of poverty sometimes seen in East African pastoral communities (Lai 2007). Overall, the well-being of families decreased, and their need for supplemental foods, such as gifts from neighbours and relatives or aid, increased (Figure 4F). The effects of leasing out land for wheat production is the focus of the second scenario. We estimated from high resolution satellite imagery that in 2011 about 420 ha of the study area was in commercial wheat production (black shaded area in Figure 5E). In simulations, livestock were not allowed to access these wheat fields. We modified the layers used in DECUMA to essentially restore the wheat fields to native pastures, or to convert more of the area to wheat. Relative to the observed area in wheat, in simulations we used 0%, 25%, 50%, 75%, 100%, 125%, 150%, 175%, and 200% of the area in wheat production (Figure 5A–I). Maps of Siambu showing increased area under wheat cultivation (black shading) from 0% (5A) to 200% of current cultivation (5I). 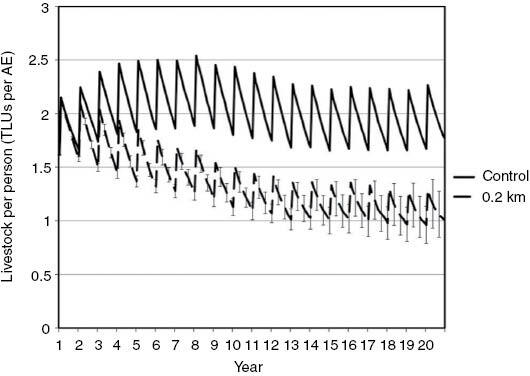 Increasing cultivation and reducing areas available for livestock grazing caused the TLUs per AE to decline by the equivalent of about 0.25 cattle per person; a significant decline for families with only 2 TLUs per AE (Figure 6). That said, cultivation went from about 5% of the study area as observed to about 10% in the simulation. Livestock lost access to prime grazing areas, but ample areas remained available to them and effects on the coupled system were fairly modest. For example, palatable dwarf shrub biomass decreased as areas where that functional group is more common were more heavily grazed by displaced livestock (Figure 7A). The amount of energy families acquired from meat declined as the livestock herd declined (Figure 7B), and income tended to decline slightly (Figure 7C). As in the previous scenario, changes in income were buffered somewhat by people’s tendency to sell animals if resources are limited. Change over time in TLU per AE comparing different amounts of wheat cultivation from 0% of current cultivation to 200% of current cultivation. Effects of different levels of cultivation on selected ecological and household variables. Our simulations use a comprehensive process-based ecosystem model and the most complete pastoral household model of which we are aware, but they remain generalizations. Results are not intended to be predictions of what may happen 20 years from today. Too many contingencies may occur to allow us to claim modeling results are predictive. Instead, the results reported here capture the magnitudes and directions of change one may expect given changes in rules or behaviours captured in the scenarios, all else being kept constant. The scenarios suggest varied outcomes depending on land use choices made by households and the land use rules adopted at community level. It is important to note that the simulations produce aggregate results, while actual results for different households would vary depending on many factors. As we have seen above, there is considerable stratification in this population and that would influence the effects of land use changes. In general, however, if the pastoral economy is privileged, then access to grazing land will be retained – for example by adopting the reciprocal access to grazing land rule. In this case, grazing orbits will not be reduced and livestock numbers will not decline (at least, not for this reason). In this scenario, however, land devoted to crop production will face limits since there is a trade-off between retaining pasture and growing crops – both cannot be done simultaneously on the same piece of land. Thus, the baseline scenario retains access for grazing but puts limits on fencing and cultivation. Such an outcome will favour those who own more livestock who can take advantage of the greater access. On the other hand, if cultivation is increased, livestock mobility will decrease somewhat since more land will be cultivated leaving less land available for grazing, except perhaps during fallow periods. Incomes may be expected to become more imbalanced. In this scenario, household livestock numbers will decline due to less access to grazing while the families that lease out land for wheat would gain monthly or annual payments (e.g. Boone et al. 2011). Having leased out their land for wheat production, four pathways for those families are plausible. They may (1) emigrate during the time the lease is active or were absentee from the start, or (2) live on a small plot without livestock. These options would help reduce effects of loss of grazing lands on the remaining livestock. Families may (3) continue to graze their animals on the reduced land available, or the most potentially damaging option is that (4) families may use their income from leased land to purchase additional livestock (e.g. Boone et al. 2011). In our simulations, the pathway represented combines numbers 2 and 3, in that people lived on remnants of their parcels and grazed their animals on the pastures that remained accessible. The money families may have been paid to lease their land was not represented in household economies here; its effect would dominate simulation results through the purchase of livestock, etc. (as in 4 above), and we wanted to focus on the effects of changes in access on remaining families. In this regard, the simulation follows pathway 1 above, with money for payments flowing out of the study area, to off-site family members, for example. This may offset some of the losses of livestock due to reduced grazing orbits. Since more land is used for cultivation, however, there will be limits on the ability of households to add more livestock. Perhaps they will invest in fewer but more productive livestock that they can raise within their parcels, as Nashampai hopes. Or, perhaps they will invest in other things, such as fencing their entire parcel, which they can then rent out for cultivation or grazing. The declines in well-being in household simulations may bode poorly for the pastoral community in Siambu, but as discussed above, those who favour enforcing parcel boundaries are most apt to have smaller livestock herds and to rely upon off-site wages and diversified incomes. These diverse sources of income are represented in DECUMA in a static way, and they cannot offset livestock declines. In reality, if these sources of income become more important in the community, they may offset the losses associated with declining livestock. Our findings complement other studies that point to the important impacts of diversification on pastoral livelihoods ( Homewood et al. 2009; Boone et al. 2011). What does this all mean for the “new commons” in Siambu? In terms of the “privatized commons” on private parcels, continued common access to this land hinges on the ongoing moral force of sharing norms, the consolidation of the reciprocal grazing rule, described above, and limits on fencing. In addition, residents of Siambu are still able to access grazing land outside the privatized area in their group ranch, the government forest, and through negotiated access to other group ranches. These areas act as a kind of safety valve for herders, and remain relatively accessible, although conflict with neighbouring ethnic groups has put limits on movement in the past. The future of the group ranch remains uncertain. Some young men want to sub-divide it into individual parcels, but so far this has not happened and it remains accessible to all, although it is far less desirable land for grazing than the privatized area. Our analysis shows that privatizing pastoral land does not destroy the commons. Instead, a “new commons” has emerged backed by social norms that encourage continued collective use of land, even though the land is privately owned. This situation enables the continuation of mobile pastoralism, but the practice of pastoralism is also changing as families pursue more diversified livelihoods and display quite divergent visions of the future. Simulation models suggest that pastoral livestock production can be maintained up to certain limits, but is seriously threatened if access to pastures is highly restricted. Research for this article was conducted through a grant from the National Science Foundation (BCS-0822752). Lesorogol conducted ethnographic and survey research and Boone developed and conducted computer simulation models. We thank our research assistants, Prame Lesorogol and Kate Grillo, the Samburu families who participated in the research, and the Kenya government for research permission. Baird, T. D and Gray, C. L (2014). Livelihood Diversification and Shifting Social Networks of Exchange: A Social Network Transition?. World Development 60: 14–30. Boone, R. B (2000). Integrated Management and Assessment System: Training Manual. Instruction Manual Created with the Support of the Global Livestock Collaborative Research Support Program. Dordrecht: Springer, US Agency for International Development. Boone, R. B, Coughenour, M. B, Galvin, K. A and Ellis, J. E (2002). Addressing Management Questions for Ngorongoro Conservation Area using the Savanna Modeling System. African Journal of Ecology 40: 138–150. http://dx.doi.org/10.1046/j.1365-2028.2002.00357.x. Boone, R. B, BurnSilver, S. B, Thornton, P. K, Worden, J. S and Galvin, K. A (2005). Quantifying Declines in Livestock Due to Subdivision. Rangeland Ecology & Management 58: 523–532. http://dx.doi.org/10.2111/1551-5028(2005)58[523:QDILDT]2.0.CO;2. Boone, R. B, Galvin, K. A, BurnSilver, S. B, Thornton, P. K, Ojima, D. S and Jawson, J. R (2011). Using Coupled Simulation Models to Link Pastoral Decision Making and Ecosystem Services. Ecology and Society 16(2): 6. [online] URL: http://www.ecologyandsociety.org/vol16/iss2/art6/. Coleman, E. A and Mwangi, E (2015). Conflict, Cooperation, and Institutional Change on the Commons. American Journal of Political Science 59(4): 855–865. Coughenour, M. B (1985). Graminoid Responses to Grazing by Large Herbivores: Adaptations, Expectations and Interacting Processes. Annals of the Missouri Botanical Garden 72: 852–863. http://dx.doi.org/10.2307/2399227. Coughenour, M. B (1992). Spatial Modelling and Landscape Characterization of an African Pastoral Ecosystem: A Prototype Model and Its Potential Use for Monitoring Drought. Ecological Indicators. McKenzie, D. H, Hyatt, D. E and McDonald, V. J eds. Vol. 1: 787–810. New York, NY: Elsevier Applied Science. Dahl, G and Hjort, A (1976). Having Herds: Pastoral Herd Growth and Household Economy. Stockholm: University of Stockholm Press. Eastman, J. L, Coughenour, M. B and Pielke, R. A Sr. (2001). The Regional Effects of CO2 and Landscape Change Using a Coupled Plant and Meteorological Model. Global Change Biology 7: 797–815. http://dx.doi.org/10.1046/j.1354-1013.2001.00411.x. Ellis, J and Coughenour, M. B (1998). The SAVANNA Integrated Modeling System In: Drylands: sustainable use of rangelands in the twenty-first century. Squires, V and Sidahmed, A eds. : 97–106. Rome, Italy: International Fund for Agricultural Development (IFAD) Technical Reports. Fernandez-Gimenez, M. E (2002). Spatial and Social Boundaries and the Paradox of Pastoral Land Tenure: A Case Study from Postsocialist Mongolia. Human Ecology 30(1): 49–78. http://dx.doi.org/10.1023/A:1014562913014. Fernandez-Gimenez, M. E (2006). Land Use and Land Tenure in Mongolia: A Brief History and Current Issues, Paper presented at the Rangelands of Central Asia. Proceedings of the Conference on Transformations, Issues, and Future Challenges. USDA Forest Service Proceedings, 30–36. Food and Agriculture Organization of the United Nations (FAO). Pastoralism in the New Millennium. Rome, Italy: FAO Animal Production and Health Paper 150. Galvin, K, Reid, R, Behnke, R Jr and Hobbs, N. T eds. (2008). Fragmentation in Semi-Arid and Arid Landscapes: Consequences for Human and Natural Systems. Dordrecht: Springer. Grimm, E and Lesorogol, C (2012). The Impact of Land Privatization on Cooperation in Communal Farm Labour in Kenya. Human Ecology 40: 69–79. http://dx.doi.org/10.1007/s10745-011-9454-3. Grimm, V, Berger, U, DeAngelis, D. J, Polhill, J. G, Giske, J and Railsback, S. F (2010). The ODD Protocol: A Review and First Update. Ecological Modelling 221: 2760–2768. http://dx.doi.org/10.1016/j.ecolmodel.2010.08.019. Homewood, K, Trench, P. C and Kristjanson, P (2009). Staying Maasai?. New York: Springer. http://dx.doi.org/10.1007/978-0-387-87492-0. Iannotti, L and Lesorogol, C (2014). Dietary Intakes and Micronutrient Adequacy Related to the Changing Livelihoods of Two Pastoralist Communities in Samburu, Kenya. Current Anthropology 55(4): 475–482. http://dx.doi.org/10.1086/677107. Kenya Soil Survey. The Soil and Terrain Database for Kenya at Scale 1:1,000,000 (version 1.0). Nairobi: Kenya Soil Survey, National Agricultural Laboratories, Kenya Agricultural Research Institute. Lai, C (2007). How Livestock is Used as a Coping Mechanism with Respect to Food Insecurity Among Livestock Keepers of Africa: A Literature Review from a Current Perspective. Arden Hills: Land O’ Lakes International Development and USAID, p. 156. Lesorogol, C (2008a). Land Privatization and Pastoralist Well-being in Kenya. Development and Change 39(2): 309–331. http://dx.doi.org/10.1111/j.1467-7660.2007.00481.x. Lesorogol, C (2008b). Contesting the Commons: Privatizing Pastoral Lands in Kenya. Ann Arbor: University of Michigan Press. Lesorogol, C (2010). The Impact of Privatization on Land Inheritance among Samburu Pastoralists in Kenya. Development and Change 41(6): 1091–1116. http://dx.doi.org/10.1111/j.1467-7660.2010.01668.x. Lesorogol, C (2014). Redefining the Meaning of Land: Property Rights and Land use in a Privatized commons in Kenya In: Research in Economic Anthropology. Wood, D ed. Vol. 34: 211–233. Bingley, UK: Emerald Group Publishing Limited. http://dx.doi.org/10.1108/S0190-128120140000034007. Lesorogol, C, Chowa, G and Ansong, D (2011). Livestock Inheritance and Education: Attitudes and Decision-Making Among Samburu Pastoralists. Nomadic Peoples 15(2): 82–103. http://dx.doi.org/10.3167/np.2011.150206. Little, P. D, Smith, K, Cellarius, B, Coppock, D. L and Barrett, C (2001). Avoiding Disaster: Diversification and Risk Management Among East African Herders. Development and Change 32: 401–433. http://dx.doi.org/10.1111/1467-7660.00211. McCabe, J. T, Leslie, P. W and DeLuca, L (2010). Adopting Cultivation to Remain Pastoralists: The Diversification of Maasai Livelihoods in Northern Tanzania. Human Ecology 38(3): 321–334. http://dx.doi.org/10.1007/s10745-010-9312-8. McCabe, J, Smith, N, Leslie, P and Telligman, A (2014). Livelihood Diversification Through Migration Among a Pastoral People: Contrasting Case Studies of Maasai in Northern Tanzania. Human Organization 73(4): 389–400. Ostrom, E (1990). Governing the Commons: The Evolutions of Institutions for Collective Action. Cambridge: Cambridge University Press. http://dx.doi.org/10.1017/CBO9780511807763. Reid, R. S, Fernández-Giménez, M. E and Galvin, K. A (2014). Dynamics and Resilience of Rangelands and Pastoral Peoples Around the Globe. Annual Review of Environment and Resources 39: 217–242. http://dx.doi.org/10.1146/annurev-environ-020713-163329. Scoones, I (1994). Living with Uncertainty. London: Intermediate Technology. Thornton, P.K, Fawcett, R. H, Galvin, K. A, Boone, R. B, Hudson, J. W and Vogel, C. H (2004). Evaluating Management Options that Use Climate Forecasts: Modelling Livestock Production Systems in the Semi-Arid Zone of South Africa. Climate Research 26: 33–42. http://dx.doi.org/10.3354/cr026033. Williams, D. M (2002). Beyond Great Walls: Environment, Identity, and Development on the Chinese Grasslands of Inner Mongolia. Stanford: Stanford University Press.